Americana Thermally Modified Decking is White Ash, grown, harvested, milled and produced in Pennsylvania! The Thermal Modification process uses heat and steam to transform and stabilize the molecules in the wood so that they won’t absorb moisture rendering the finished product to be insect, rot and decay resistant! 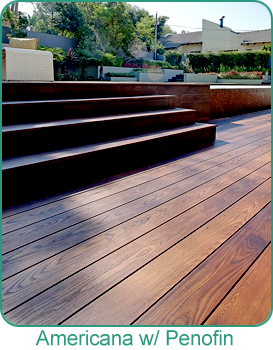 The Thermal modification process creates a decking that has an exotic appearance, contains no chemicals, has an extremely low carbon footprint and is sustainable from Forest to Finish! Symmetrical, structural end joint can float between joists.